Here is our amazing Pledge of Allegiance Mega Bundle! It includes activities on the Pledge to the American Flag, the Pledge to the Christian Flag and Pledge to the Bible. There are 22 activities in all. 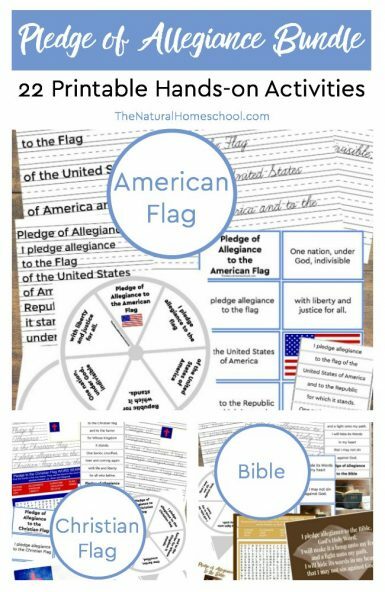 When it comes to practicing handwriting, the Pledge to the American flag handwriting pages (manuscript AND cursive) will be perfect for your kids! If your kids learn better by making a craft, then the US Flag Pledge of Allegiance wheel craft will be right up their alley! 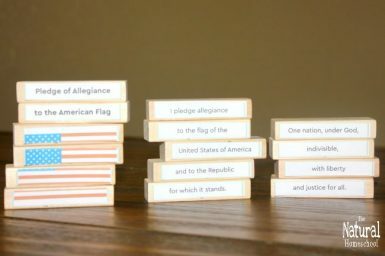 The Pledge of Allegiance words printable cards are great to start and end the unit because they are great to use as an introduction and as a review quiz. 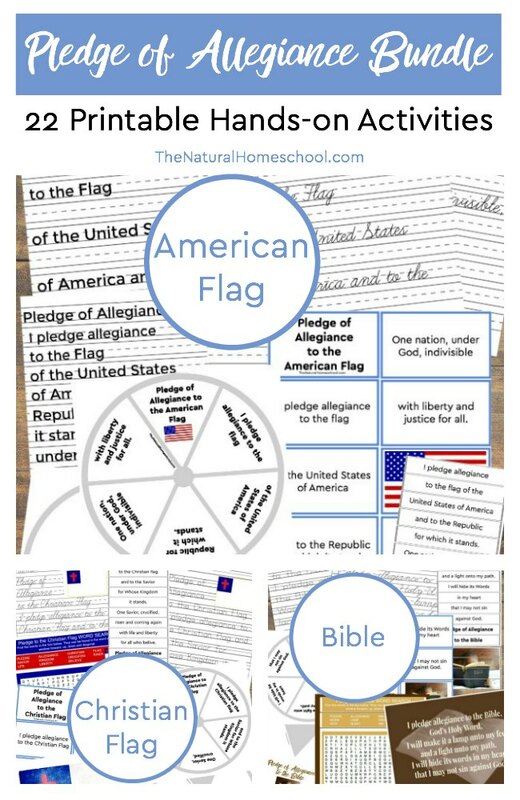 The American Pledge of Allegiance printable game is also a great quiz or just for fun. Another fun activity is the American Flag Pledge word search! Younger kids will have a blast with this activity! It’s Cutting Strips with the words of the Pledge of Allegiance to the Flag. 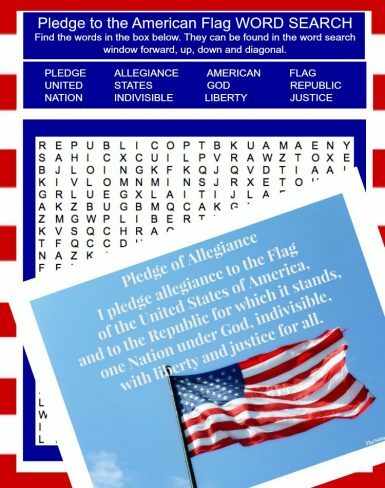 We love to print this Pledge of Allegiance poster with pledge to the American flag words in color and laminate it to display in our homeschool room. It is beautiful! 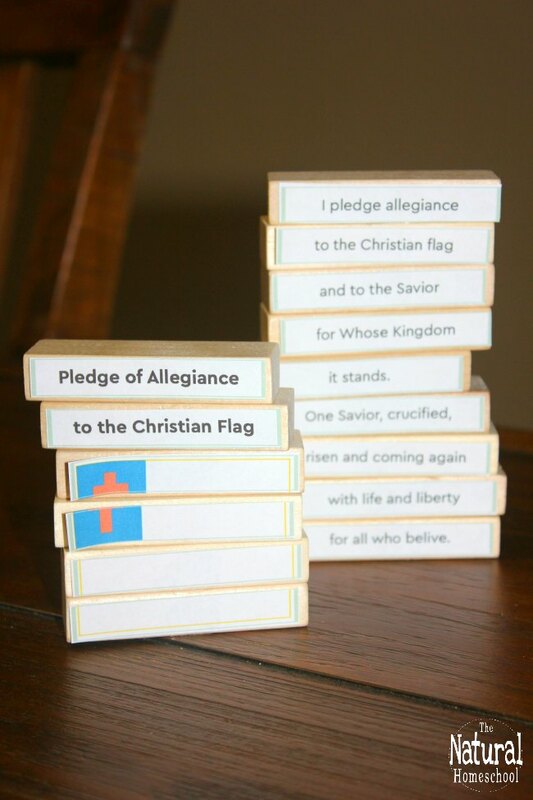 My kids love practicing the pledge of allegiance to the Christian flag with our super fun Pledge of allegiance words printable game! We pair it up with the Pledge of allegiance flag words search because they learn to spell and pronounce the words in the pledge. Kids love the world-famous Words of the pledge of allegiance to the flag wheel craft! They will have hours of fun with it! And don’t forget to print out the beautiful Printable pledge of allegiance poster! 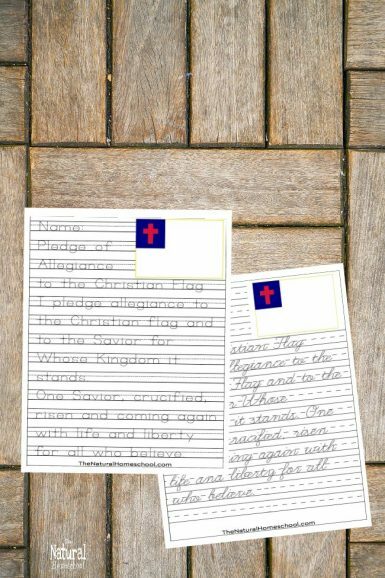 Have your little ones practice the Pledge of allegiance to the Christian flag with the handwriting pages in manuscript and in cursive! 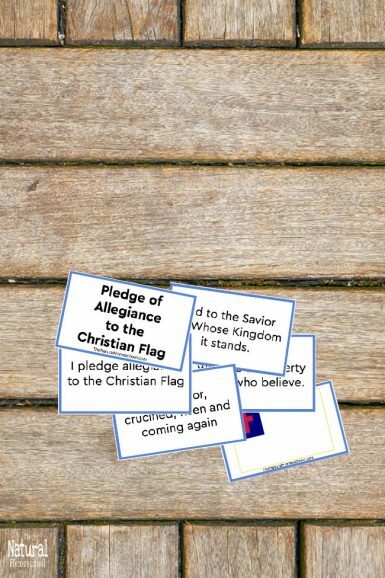 And quiz each other with a fun fill-in-the-blank or “put the cards in the right order” game with this Christian flag pledge cards! The Bible is God’s Holy Word. It is a lamp unto my feet and a light unto my path. The Bible says that I am to hide its words in my heart so I don’t sin against God. Jesus Christ can help us when we try to stay on the path and will hide His words in our hearts to use daily. Whether you learned it in vacation Bible school or not, it is very beneficial to learn the words to the pledge of allegiance to the Bible. Here are some activities that will help you and your kids do just that! Start out by printing out and laminating this beautiful Printable pledge of allegiance poster! Laminating it will make it more durable, but you can also put it in an 8×10 picture frame. 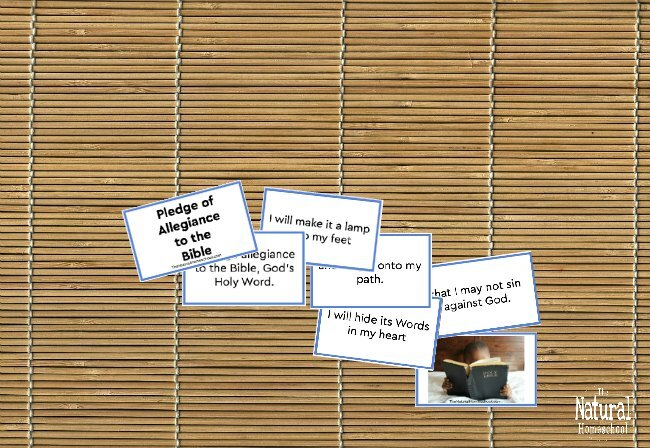 The Bible pledge of allegiance cards go hand-in-hand with the poster because it takes the pledge words and breaks them down into phrases to make it easier for kids to learn by heart. A fun and beautiful Pledge of allegiance to the Bible wheel craft to cut and use to memorize the words in the right order. The Pledge of allegiance words printable game to have fun as a family while learning God’s Word! 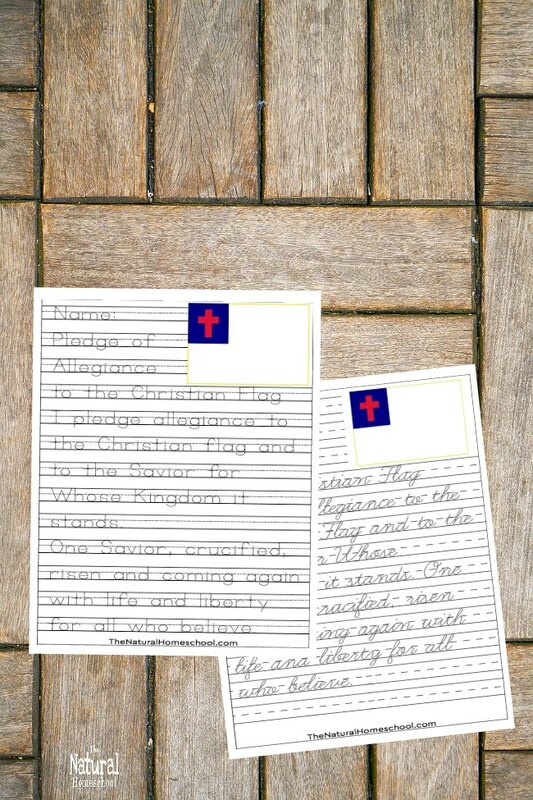 An “I pledge allegiance to the Bible” handwriting page in manuscript is also included. 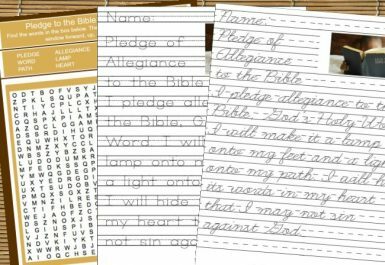 A Pledge of allegiance to the Bible printable handwriting page in cursive! And lastly, a Pledge of allegiance to the Bible word search that is so much fun!